Impairment in the work place may involve: a) Substance use disorder (SUD), i.e., illicit drugs, prescription medicines or alcohol, b) diminished or dangerous physical condition and c) mental health issues. The impairment may be temporary, chronic or escalating. A diagnosis of SUD is based on evidence of the following four factors; impaired control, social impairment, risky use, and pharmacological criteria. These findings result in alcohol and/or drugs causing failure to meet major responsibilities at work, school and/or home (APA, 2015). The Substance Abuse and Mental Health Services Administration, (SAMHSA), estimates that 4.4% of health care workers engage in the heavy drinking of alcohol and 5.5% use illicit substances (SAMHSA, 2014). Unfortunately, there are no definitive statistics on the use of drugs and alcohol amongst nurses. Accurate and current statistics are difficult to obtain because most users are reluctant to report SUD for fear of losing their licenses. The American Nurses Association (ANA) estimates 10% of nurses have a substance use disorder which is roughly equal to the general population cited by the National Institute on Drug Abuse. The American Nurses Association (ANA) reported there were 2,860,000 employed nurses in 2012. If the 10% estimate of SUD nurses is correct, 286,000 nurses would fall in the category of having a SUD issue. A comprehensive landmark study about substance use (Trinkoff, & Storr) was published in 1998 in the American Journal of Public Health, unfortunately, it has not been replicated recently. The researchers found in a stratified sample of 4, 438 registered nurses 3.6% used illicit drugs, marijuana and cocaine, and 6.6% prescription narcotics or sedatives. 16% engaged in binge drinking, defined as drinking 5 or more alcoholic drinks in one limited time span. The study also found that emergency nurses were 3.5 times more likely to use marijuana or cocaine compared to nurses in women's health, pediatrics, and general practice. The nurses working in anesthesia, critical care, oncology, and psychiatry also reported higher use of drugs (Trinkoff & Storr, 1998). Much has changed in nursing since the publication of this 1998 article. There is a significant need for a current replication of this study. Data from the 2010 National Council of State Boards of Nursing (NCSBN) disciplinary programs reported an average of 128 nurses (total of 6400 plus), from each State Board of Nurses were disciplined for substance use issues in one year (Monroe et al, 2013). A recent review of state board publications that report both the violation and the disciplinary action indicates that drug associated violations are significant grounds for discipline. For example, 53% disciplinary actions taken by the Mississippi Board of Nursing in April 2017 were drug related and 33% of the disciplinary actions taken by the Nevada State Board of Nursing for the period of February 6, 2017 through April 5, 2017 were drug related. Collectively the Boards of Nursing are only monitoring or disciplining about .02% of the ANA estimated 286,000 impaired nurses. It is unlikely that the vast majority of the remaining 99.08% of SUD impaired nurses are enrolled in private and confidential treatment programs. Substance use disorder amongst nurses is an underreported and undertreated problem in the U.S.
Substance use disorder amongst nurses is significantly underreported and undertreated in the U.S. The definition also states that this does not apply to temporary responses to life losses, such as the death of a loved one, or stressors or behaviors that are culturally sanctioned. 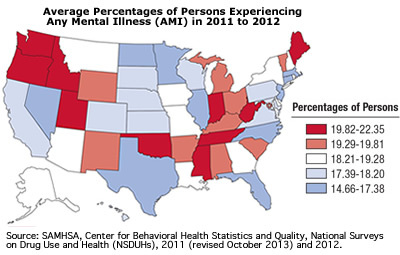 SAMHSA also distinguishes between a serious mental illness (SMI) or any mental illness (AMI). An adult with AMI was defined as having any mental, behavioral, or emotional disorder in the past year that met DSM-V criteria (excluding developmental disorders and SUD). Adults with AMI were defined as having SMI if they had any mental, behavioral, or emotional disorder that substantially interfered with or limited one or more major life activities. According to a 2014 report by SAMHSA, 43.6 million adults, an estimated 18% of all adults, 18 or older had AMI in the U. S. There were an estimated 9.8 million adults with SMI. There are no current major studies about the incidence of AMI or SMI that occur amongst nurses in America. Studies of nurses in the U. S. are on depression, stress, compassion fatigue and burnout. Letvak, Ruhm & Gupta (2012) found reduced on-the-job productivity due to mental health issues, particularly depression. They studied the extent to which depression in 1,171 RNs in North Carolina affected their work productivity. They found the incidence of depression in this group of nurses to be 17% compared to the national rate of 9%. These health issues have a significant impact on patient care. Letvak, Ruhn and Gupta (2012) report an increase in medication errors, patient falls and lower quality of care occur when nurses work with pain and/or depression. Fatigue amongst nurses has also been shown to diminish patient care. A study by Barker and Nussbaum (2011) of 745 registered nurses found fatigue levels to be correlated with perceptions by nurses of poor performance. Long shift hours and long hours worked in a week’s time correlated with fatigue. Many if not most severe chronic physical impairments are classified as a disability rather than an impairment. The Americans with Disabilities Act of 1990 (ADA) defines disability as a physical or mental impairment that substantially limits one or more of the major life activities such as walking, seeing, and hearing, of an individual. The Bureau of Labor statistics states that hospital workers have a higher incidence of injury and illnesses (6 cases per 100 full-time employees) than the "dangerous" industries like construction and manufacturing. Of hospital worker injuries 45% are due to lifting, moving or otherwise interacting with patients. The second most common events (25%) leading to injuries and illnesses in hospitals are trips, slips and falls. Employees of psychiatric and substance disorder institutions are subject to other injuries from patients (Dressner, 2017). The ANA surveyed nurses in 2011 to discover respondent (n=4614) concerns about health and safety in their work environments. 74% voiced concern regarding their risk from "Acute/chronic effects of stress and overwork" (ANA, 2011). 62% voiced concern regarding their risk of disabling musculoskeletal injury (ANA, 2011). Nearly all nurses indicated that they have worked despite experiencing musculoskeletal pain, including 8 in 10 who say it is a frequent occurrence (ANA, 2011). More than half say they have experienced musculoskeletal pain caused or made worse by their job (ANA, 2011). Fronteira and Ferrinho (2011), from a review of 187 studies, found nurses are at greater risk of developing musculoskeletal injuries and blood-borne pathogens than other healthcare workers. American Nurses Association (ANA) & International Nurses Society on Addictions (In tNSA) (2013). Addictions nursing: scope and standards of practice. Silver Spring, MD: Nursesbooks.org. American Psychiatric Association (2015). Diagnostic and Statistical Manual of Mental Disorders (DSM-5®), Fifth Edition. Arlington, VA: American Psychiatric Association Publishing. Barker, L.M. & Nussbaum, M.A. (2011). Fatigue, performance and the work environment: A registered nurse survey. Journal of Advanced Nursing 67(6), 1370–1382. Dressner, M.A. (2017). Hospital workers: an assessment of occupational injuries and illnesses. Monthly labor Review. Bureau of Labor statistics retrieved on July 5, 2017 from https://www.bls.gov/opub/mlr/2017/article/pdf/hospital-workers-an-assessment-of-occupational-injuries-and-illnesses.pdf. Fronteira, I., & Ferrinho, P. (2011). Do nurses have a different physical health profile? A systematic review of experimental and observational studies on nurses’ physical health. Journal of Clinical Nursing, 20 (17), 2404-2424. Hunsaker, S.1., Chen, H.C., Maughan, D. & Heaston, S. (2015). Factors that influence the development of compassion fatigue, burnout, and compassion satisfaction in emergency department nurses. J Nurs Scholarsh. 47(2),186-94. Letvak, S., Ruhm, C., & McCoy, T. (2012). Depression in hospital employed nurses. Clinical Nurse Specialist: The Journal for Advanced Nursing, 26 (3), 177-182. Monroe, T. B., Kenaga, H., Dietrich, M. S., Carter, H. & Cowan, R. L. (2013). The Prevalence of Employed Nurses Identified or Enrolled in Substance Use Monitoring Programs. Nursing Research, 62 (1), 10-15. Perry, L., Lamont, S., Brunero, S., Gallagher. R. & Duffield, C. (2015). The mental health of nurses in acute teaching hospital settings: a cross-sectional survey BMC Nursing,14 (15). Substance Abuse and Mental Health Services Administration (SAMHSA) 2014. Results from the 2013 National Survey on Drug Use and Health: Summary of National Findings, NSDUH Series H-48, HHS Publication No. (SMA) 14-4863. Rockville, MD: Substance Abuse and Mental Health Services Administration (SAMHSA). Trinkoff, S. M. & Storr, C.L. (1998). Substance Use among Nurses: Differences between Specialties. American Journal of Public Health 88, 581-5.